Crescent-shaped Croatia is located in South Eastern Europe, across the Adriatic Sea from Italy and shares its borders with Hungary, Bosnia and Herzegovina, Slovenia, Serbia and Montenegro. Croatia boasts over six thousand kilometres of coastline, four thousand of which belong to islands, cliffs and reefs. On the subject of islands, there are more than one thousand in Croatia, of which fifty are inhabited. The largest islands are Krk and Cres, while the other popular island destinations include Hvar, Brac, Korcula, Mljet, Vis and Pag. The Croatian tourist boards slogan is ‘Mediterranean as it once was’, and whilst the country continues to march up the rankings of the world’s most popular tourist destinations, Croatia hasn’t really given in to mass tourism, despite the need to accommodate the continued increase in visitors. Getting to Croatia by ferry requires a trip across the Adriatic Sea from Italy with many ports dotted along the coast, from as far north as Venice to as far south as Bari. There are numerous arrival ports to choose from in Croatia too, travelling both to the mainland and directly to the popular holiday islands. 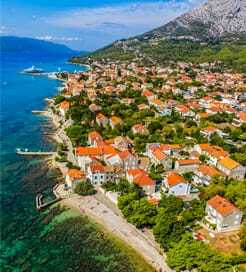 Travelling among the Croatian islands is easy too with numerous crossings offered to and from the mainland as well as between the islands themselves. Ferry crossings to Croatia from the North Adriatic are generally high speed passenger only jets and the services are seasonal however if you travel from further down the Adriatic Sea then you’ll find regular crossings using modern conventional ships with plenty to do on board.